Tony Sparano was born October 7, 1961 in West Haven, Connecticut and is the current head coach for the Miami Dolphins of the National Football League. Sparano is the only NFL head coach to lead a one-win team to the playoffs the following year, which he accomplished in his first season with the Dolphins. Beginning his NFL career in 1999, Sparano was fired in three staffing purges after brief stints with the Cleveland Browns, Washington Redskins and Jacksonville Jaguars. Sparano was hired by new Dallas Cowboys coach Bill Parcells in 2003, rising from tight ends coach to assistant head coach in his five seasons in Dallas. Sparano was the offensive play-caller for Dallas in 2006, but ceded the responsibilities to new offensive coordinator Jason Garrett the following season. After firing Cam Cameron following a franchise-worst 1-15 season, the Miami Dolphins and new executive vice president of football operations Parcells hired Sparano to a four-year contract on January 16, 2008. In his first season, Sparano led the Dolphins to an 11-5 record and the AFC East division title, securing the franchise's first playoff berth in eight seasons before losing to the Baltimore Ravens in a wild-card game. The 10-win turnaround tied an NFL record and Sparano finished one vote behind Atlanta Falcons first-year head coach Mike Smith in balloting for the AP Coach of the Year award. Successful coaches such as a Tony Sparano have led their teams to numerous victories and do what it takes to motivate. The booking agents at AthletePromotions can assist with Tony Sparano speaking engagements or corporate appearances. We have years of experience in booking coaching keynote speeches and autograph signings. Booking a coach like Tony Sparano is a very easy process. Our agents can provide availability, fees and all costs associated in bringing out a successful coach star to your next corporate event. We can easily find Tony Sparanos agent to make this appearance happen. 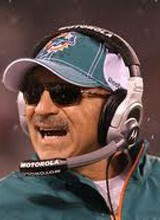 A Tony Sparano appearance will add the great speech to your upcoming event, rewarding employees, clients and customers. Most likely, fans and corporations can find Tony Sparano's official website, charity involvement, Twitter account, representation, publicist and management info at www.Tony Sparano.com.